“Religious Economics and the Economics of Religion,” Journal of Institutional and Theoretical Economics, 149 (December 1994): 769-775. “The Economic Impact of Islamic Fundamentalism,” in M. Marty and S. Appleby (eds. ), Fundamentalisms and the State: Remaking Polities, Economies, and Militance (Chicago: University of Chicago Press, 1993): 302-341. 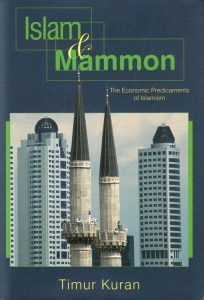 Turkish translation (by Yasemin Tezgiden): “İslâmî Köktenciliğin Ekonomik Etkileri,” in Timur Kuran, İslâm’ın Ekonomik Yüzleri (İstanbul: İletişim, 2002): 13-71.